Spread The Word about Ralph Peterson's CONTEST & Win Cool Prizes! => Please still check out the blue link below to Ralph’s Killer Instructional Video. => More Killer Amazon Reviews of this video! Video includes 2h 20-minute Lesson + 50-min Interview and is jam-packed with detailed Instruction (& 5 camera angles), PDFs, four MP3 Play-Alongs with Ralph's band & More. The contest will end Sunday, November 25th at 23:59 EST! by uploading your own YouTube Video of playing along with Ralph's Play-Along!! 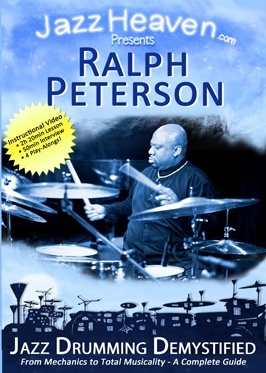 http://jazzheaven.com/ralph-peterson-contest Check out this cool Ralph Peterson Contest! The Video Response with the most YOUTUBE LIKES by the time the contest ends wins the PRIVATE LESSON with Ralph!